The objective of this project was to develop technical data and evaluate performance and utility of leaky feeder communications systems currently used in U.S. underground mines. The desired information was obtained principally through on-site surveys. Six of the seven mining companies known to be using leaky feeder communications were visited. This report covers the findings of these surveys. 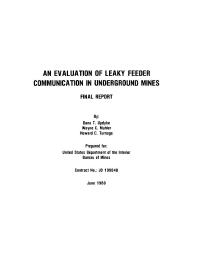 In addition, the report provides a brief background summary of mine communications, a technical discussion of leaky feeder systems, and conclusions and recommendations based on the results of the survey.